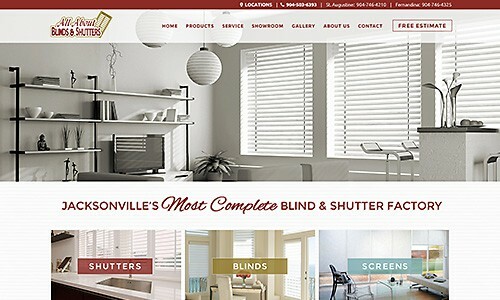 All About Blinds and Shutters is Jacksonville’s most complete blind and shutter factory. They have been manufacturing, selling, and installing window treatments since 1979. In their 38,000 square foot facility they fabricate Wood and Poly shutters, Wood and Faux blinds, Roller shades, and Custom Closets. All About Blinds’ existing website needed a modest upgrade to be more streamlined and user-friendly while meeting today’s SEO standards. Their Hubspot blog and landing pages were also updated to be inline with the new website design.